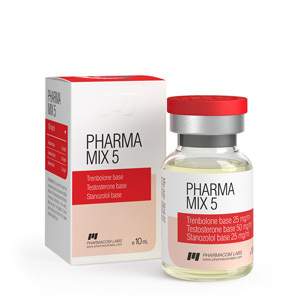 Pharma Mix-5 is an innovative steroid manufactured by PharmaCom Labs. This type of mix is ​​well established among athletes who need to quickly dry and achieve the perfect figure. Due to the use of a stanozolol, trenbolone and testosterone suspension, this mix simply burns extra pounds on your body. Pharma Mix-5 is very often used during the drying period, as it provides the fastest possible muscle mass gain, without fluid accumulation and an increase in body fat. It accelerates the process of fat loss, increases libido, strengthens the ligaments and joints, accelerates the recovery process after training. 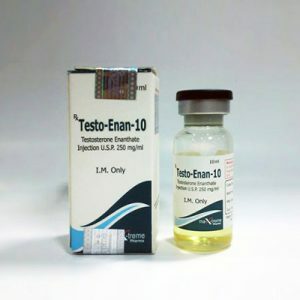 Testosterone, which is included in the complex of the drug, is presented in its pure form, which allows the substance to be absorbed faster into the blood, unlike other forms. The effect of its reception appears instantly. It increases strength performance, burns fat, increases muscle mass, increases energy level and aggressiveness in the process of training, increases libido, improves relief. Stanozolol has a high anabolic activity of 3205 from testosterone and low androgenic – 30%. It removes excess fluid, strengthens the appetite and forms rigid muscles. Trenbolone helps to gain lean muscle mass and has a quick effect, due to the fact that it is quickly absorbed into the blood.